The Ivory Coast national rugby union team, nicknamed Les Éléphants, represents Côte d'Ivoire (also known as Ivory Coast) in rugby union. The team is recognised as Ivory Coast by the International Rugby Board. 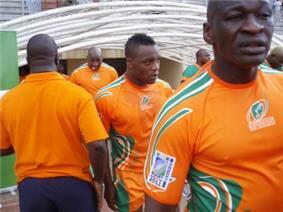 Ivory Coast participate in the annual Africa Cup and are considered a third tier rugby team. Formed in 1990, the team's most significant achievement to date was their success in qualifying for the Rugby World Cup for their first and so far only time in 1995. They have not qualified since, though they did reach the semi-finals of the African qualifying competition for the 2011 Rugby World Cup, achieving a home draw against eventual qualifiers Namibia before being defeated in their away match. Rugby union in Côte d'Ivoire is popular among school children, but the rugby union playing population in Côte d'Ivoire is still relatively small with only 14 clubs and 470 registered senior players. The Fédération Ivoirienne de Rugby, the national rugby union federation, was formed in March 1990, the same month that it joined the International Rugby Board. They qualified for the World Cup the first time in 1995 and suffered defeats by Scotland, France and Tonga. With a small player base, and starved of strong competition, the team has deteriorated in recent years. Recent defeats to Morocco mean they are ranked below the North African side. Their record in the World Cup has been poor, and they haven't managed a win. Their record defeat, 89–0 against Scotland in the 1995 tournament, led to some questioning the presence of the minor teams at the tournament. Ivory Coast, however, played much better in the following match, losing to France by 54–18, with 2 tries scored. The final match with Tonga, lost by 29–11, in the 1995 World Cup saw a major tragedy, as Max Brito suffered a cervical spine injury that left him a quadriplegic. After the 1995 Rugby World Cup, Ivory Coast took a three years break from international competition, only returning for the 1999 Rugby World Cup qualifyings, in September 1998. Ivory Coast was very unfortunate, losing all the three matches, to Namibia (10–22), Zimbabwe (0–32), and Morocco (3–6), in a tournament held in Casablanca, Morocco. After another hiatus of two years and a half, the Elephants returned for the Africa Championship, in 2001, losing both matches with Morocco, 11–18 at home and 18–20 away, and achieving an 11–11 draw with Tunisia, abroad, and a 47–0 win at home. Ivory Coast missed the 2003 Rugby World Cup qualification, after losses to Tunisia (8–13) and Morocco (21–23). In the 2007 Rugby World Cup qualifyings, they started promisingly with two wins with Senegal (20–6) and Zimbabwe (33–3), but had mixed results with Morocco, a 9–9 draw at home and a 7–23 loss abroad, and Uganda, with a 7–32 loss abroad and an 18–9 win at home, and were subsequently eliminated. The Ivorians achieved the qualification for the final stage of the 2011 Rugby World Cup finals, after a surprising 21–9 win over Morocco, in Casablanca. They faced Namibia afterwards, reaching a 13–13 draw at Abidjan, but losing by 14–54 in Windhoek, being unable to qualify once again. The Ivory Coast national team at the Stade Felix Houphouet-Boigny before their CAN Rugby World Cup 2011 qualifier vs. Zambia on 21 July 2008. Ivory Coast went on to win 32-9. Squad for the 2011 World Cup qualifiers against Namibia. Ivory Coast squad for the Africa Cup match Morocco (3-60) is available here. ^ "Ivory Coast". International Rugby Board. Retrieved 7 December 2010. ^ "International Rugby Union Statistics: Ivory Coast". Rugbydata.com. Retrieved 8 July 2011. ^ "Wet Abidjan tough for Namibians". Rugby365.com. Retrieved 2010-02-28. ^ "Namibia win home qualifier". Rugby365.com. Retrieved 2010-03-07. ^ "LA SELECTION EN TUNISIE POUR LA CAN" (in Français). rugbivoire.midiblogs.com/. Retrieved 2010-06-17.